The Cuisinart EOS126-28CBLSCP stockpot features durable heavy duty construction for long lasting use. The stockpot has enamel on steel for quick and even heating and is compatible with all heat sources, including induction. This Stockpot includes wide sides handle for secure and comfortable grip along with tight-fitting lid to seal in moisture and nutrients for healthier flavorful results. It has white enamel interior which will not stain or absorb odors. 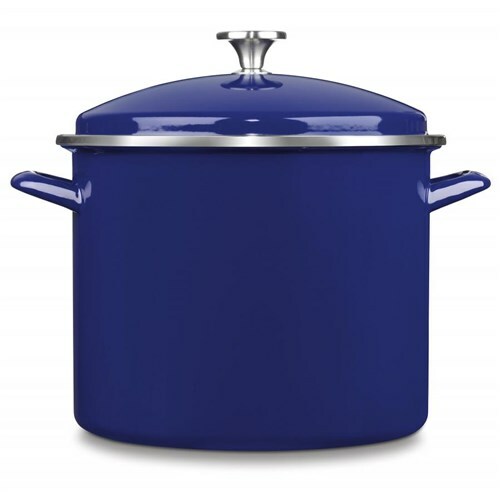 The Cuisinart 3-Pc 12 Qt Stockpot Steam Set - Blue has many exciting features for users of all types. 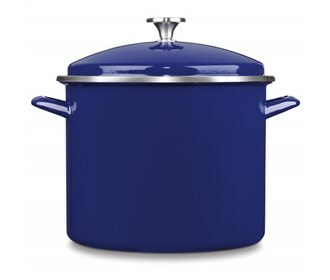 See the Cuisinart 3-Pc 12 Qt Stockpot Steam Set - Blue gallery images above for more product views. The Cuisinart 3-Pc 12 Qt Stockpot Steam Set - Blue is sold as a Brand New Unopened Item.